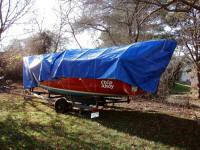 Season ‘06 is over, bring on '07! 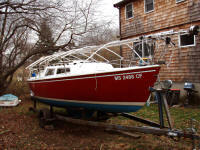 From the stern, frame completed. 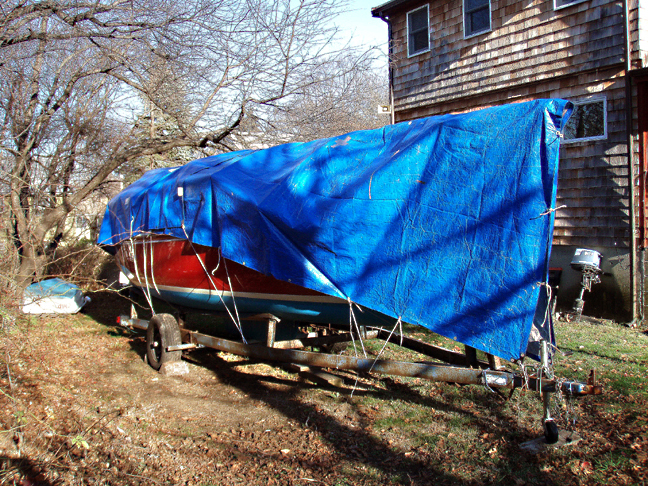 Tomorrow I'll dig out the tarps and cover the frame and boat. Boy, Chip Mate, the dinghy, sure took a beating down at the dinghy dock this season. 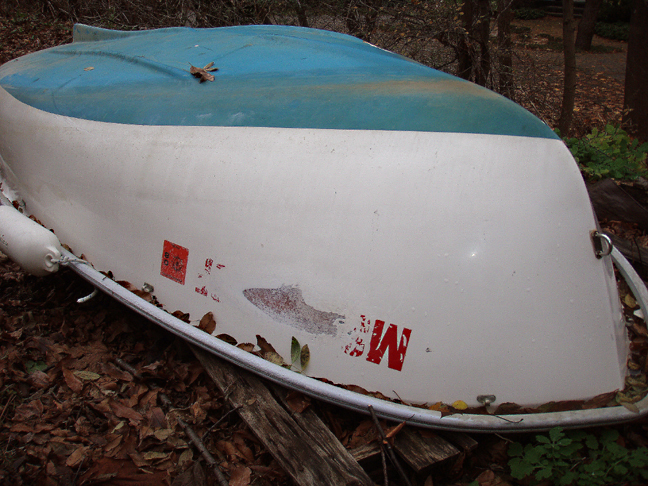 Despite my belated addition of fenders, the boats alongside it pounded away, often riding up over Chip Mate's gunwales (and new cover, wearing out holes in it as well). 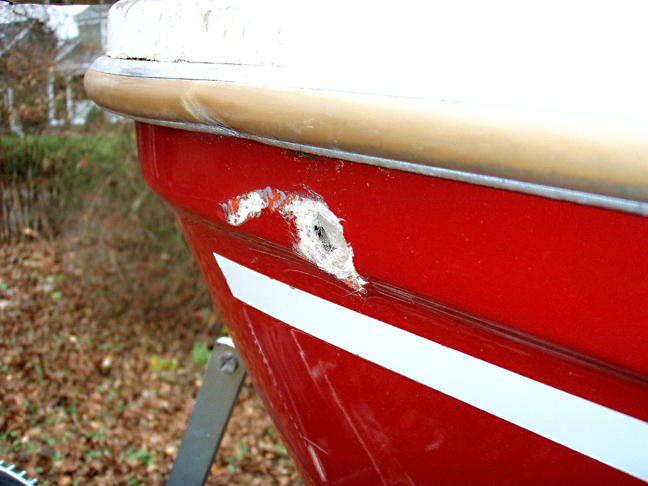 When the other dinghies were removed for the season, the decrepit skiff on one side just pushed Chip Mate against the dock, doing this damage to the bow. Yes, those used to be registration numbers where the hole was worn through the gel coat. 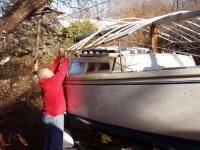 While on its mooring, I didn't think the hole caused by the loose anchor had gone all the way through the fiberglass. Obviously I was wrong, and have some fiberglass work to do on this bow as well as the dinghy's. 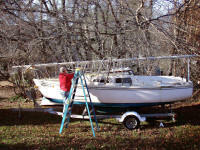 Not a good season for port side bows in my personal fleet! 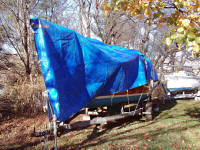 Two tarps cover each boat, over our respective PVC skeleton frames. 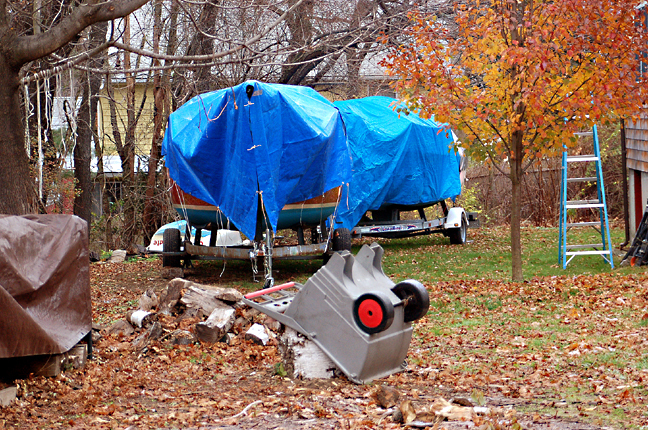 Wally's "Carpe Diem" is parked behind Chip Ahoy. "Chip Mate," the dinghy, rests on wood pallets between our boats. 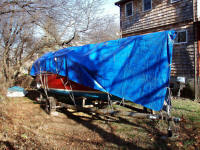 I've still got to toss a tarp over it tomorrow and anchor the tarp with stones. 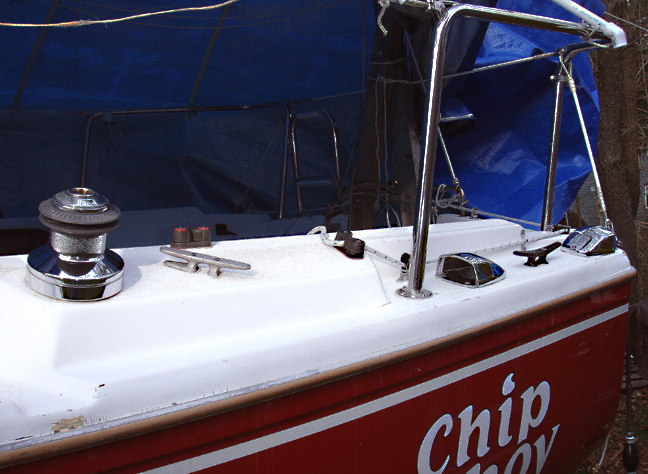 Chip Ahoy, covered from the base of its mast and roller-furler drum over the bow to its anchor light atop the mast. I run a line from the back of the tarp to a nearby tree limb. 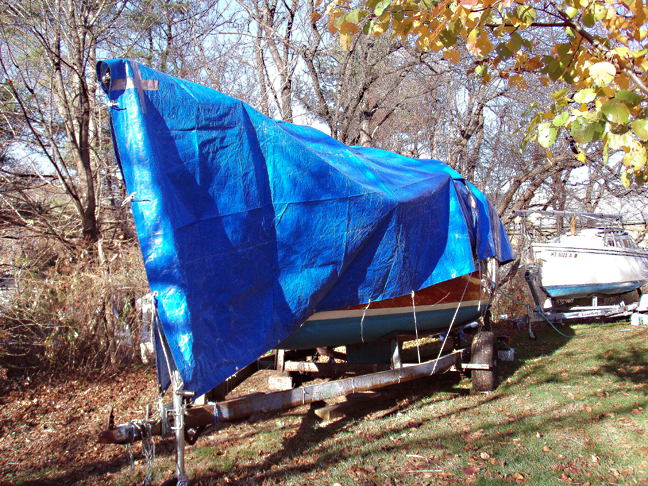 If I need to get into the boat after it's covered, I can loosen the tarp around the transom, pull the ladder up, and climb aboard beneath the tarp. Wally securing his one-piece PVC skeleton frame to "Carpe Diem's" starboard side stanchions and lifelines. 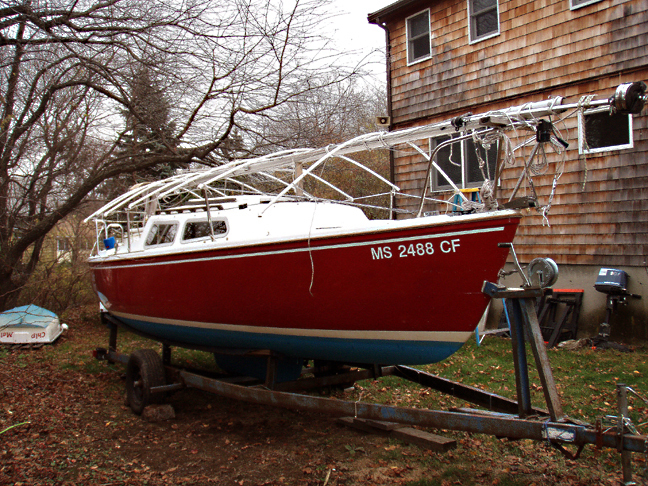 First seeing his frame last fall inspired my to build my own. 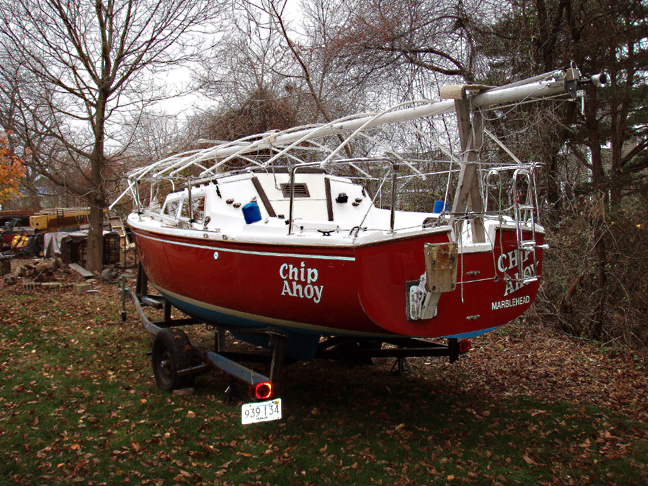 With a frame over the mast, snow slides right off as soon as it collects enough weight and mass: It doesn't catch and pocket at the lifelines before it can. 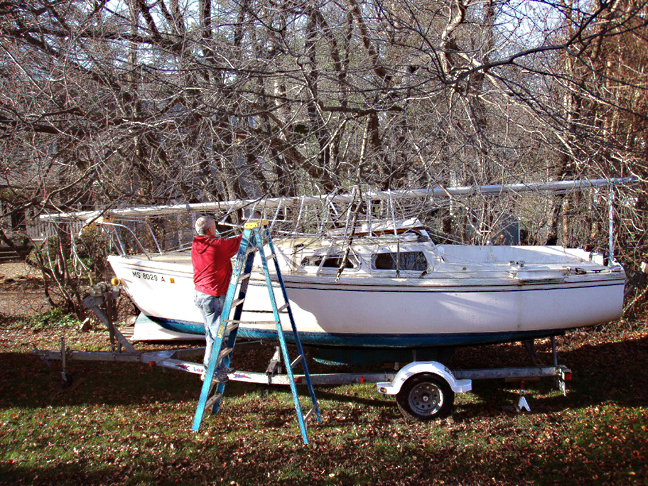 Securing the port side of his frame. 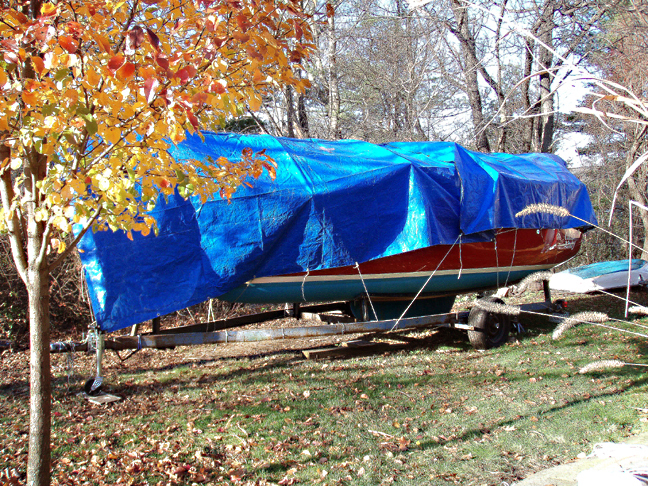 It's never-ending ... but Sailing Season '06 has ended -- bring on '07!